Sea kayakingThe route from Fort William in the west to Inverness in the east is known as the Great Glen. A series of canals, rivers and lochs allow a kayaker to paddle some 60 miles through stunning highland scenery. It generally takes between 3 and 5 days to cover the whole route depending on the size of the group, weather, fitness levels and experience. It also depends on how much you want to enjoy the surroundings and Highland hospitality as you go, or to race to the finish. A fine short trip for an evening kayaking after work or a half day paddle. 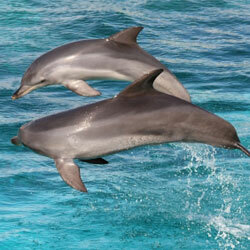 Chanonry Point is known to many locals as the place to visit if you want a good chance of seeing the resident dolphins. Fort George is an impressive fortification that is still used by the military. A trip for a sunny evening so that the sun will be shining on the superbly coloured sandstone cliffs. Countless sea birds to be seen on this part of the coastline that is also popular with climbers and fishermen. This area is also a Site of Special Scientific Interest [SSSI] due to the dinosaur footprints that can be found in the bedding planes of the sandstone. This is a sea kayaker’s paradise offering islands, coastlines and wildlife in abundance. With no significant tidal concerns and relatively sheltered waters, this is a great place to spend some time. This area provides potential for far more than just a single day out paddling. There are lots of options on the Forth Estuary to consider. Perhaps a start at South Queensferry under the iconic Forth Bridges, paddling along to Blackness Castle. Or maybe starting at Kinghorn you could paddle out to Inchkeith, the site of a world war station. There are in fact lots of ‘Inches’ to explore with likely interest from the local seals. Further out why not go and explore the Bass Rock from Seacliff or North Berwick. With thousands of birds and a colony of seals to accompany you this is a paddle well worth doing if you have a little experience. 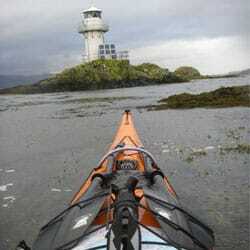 The Argyll Sea Kayak trail is 150km in length and offers some of the best sea kayaking in Europe. The route takes in some of Scotland’s most scenic coastlines and provides both the beginner and the most experienced kayaker with a thrilling and rewarding test. Why not be one of the first to tackle the full 150 km of the trail, or pick a section or two to try over a weekend? Running from Ganavan Sands, near Oban, to Helensburgh, the Argyll Sea Kayak Trail is split into eight sections. It hugs the stunning Argyll coast down to the Sound of Jura before cutting through Mid Argyll via the Crinan Canal, otherwise dubbed ‘Britain’s most beautiful shortcut’. The route then leads to the south end of Loch Fyne, before skirting Inner Kintyre and around the Kyles of Bute. The final sections lead the paddler through part of the Firth of Clyde, taking in Rothesay Bay and Wemyss Bay. Sea Kayaking is one of the very best ways to explore in depth the magnificence of the west coast of Scotland. Rich in wildlife, naturally diverse coastline, sheltered waters, islands, sandy beaches, caves and much more, offer everything you might want from a world class paddling destination. 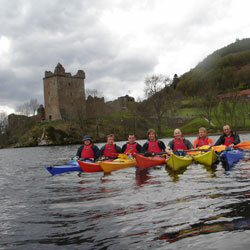 We can also offer kayaking instruction for those who would like a few pointers before setting out on their own. Whether you’re a school or youth group, a family or a bunch of mates wanting to try something new, we can help. Our experienced instructors will ensure you get the most out of a coaching session tailoring it to your needs. 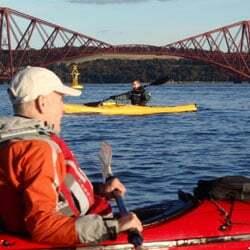 Alternatively, if you’ve already got some experience but want to tackle an expedition that’s perhaps just beyond your abilities, we can organise and lead a sea kayak expedition for you; whether it’s on the stunning West Coast of Scotland or the Fife coastline.